Unveiled at the 2013 BOVET Salon, the Tourbillon Virtuoso made a lasting impression with its original functions, innovative architecture and expression of decorative watchmaking arts, which unanimously won over the most eminent specialists and collectors of fine watchmaking. In 2015, Pascal Raffy and the artisans of the DIMIER 1738 Manufacture are revealing the Amadeo® Fleurier Virtuoso IV. This new reference adopts the same features as the Tourbillon Virtuoso, which include jumping hours, indicated by a disk appearing in an aperture. In a design feature specific to the Maison, this aperture is perfectly situated in the center of the movement. Despite the lack of available space, the DIMIER 1738 watchmakers succeeded in incorporating two star-wheels which ensure the disk performs an immediate jump at the turn of each hour. Even though the minutes are displayed by a hand, they are also indicated in an original manner as they are featured in a retrograde display. Only the upper section of the dial is marked with a scale ranging from 0 to 60 in a 160° arc. The minute hand travels across this segment over one hour. At exactly the same time as the hour disk jumps, the minute hand moves back to 0 at lightning speed and commences a new cycle, without losing a fraction of a second. The minute hand and various components of the mechanism undergo phenomenal acceleration and deceleration and very few mechanical systems would be able to withstand such stress long term. As all tourbillon movements manufactured by DIMIER 1738 benefit from astonishing autonomy, the power reserve is systematically indicated. Lasting a total of five days (120 hours), the power reserve indicator is located on the lower section of the front dial between its center and the hour window. Grand complications have accustomed collectors to movements encumbered by a complex jumble of mechanisms and components, the information on which is often tedious to read. The excellent readability of the understated Tourbillon Virtuoso IV ensures that its complexity is quickly forgotten. Like, for example, the presence of instantaneous jumping hours, retrograde minutes and a power reserve indicator fitted on a single axis. Displaying various types of information coaxially usually results in clumsy sacrifices in terms of thickness. The DIMIER 1738 watchmakers have achieved this feat without the movement’s thickness exceeding that of a similar caliber with a standard central display of the hours and minutes. The lower half of the timepiece is occupied solely by the tourbillon. It is supported by the mainplate alone, which is endowed with a distinctly unique shape. The tourbillon carriage of the Virtuoso IV creates new ties between BOVET’s historical past and its future. The balance adopts the same design features as those of the Rising Star tourbillon, in particular with the presence of the three blued weights. 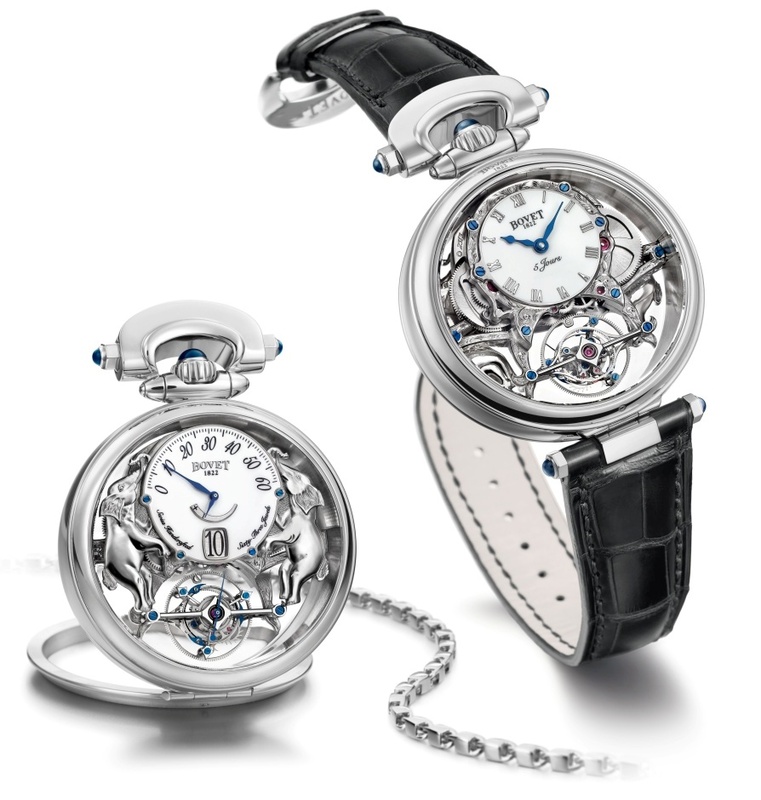 The steel parts are chamfered and polished on both sides and the carriage bridges are rounded off, while their design evokes the index-assembly of the timepieces produced by the Bovet brothers in the 19th century. Eager to go further still, the DIMIER 1738 watchmakers were required to draw on both their expertise and the latest technologies to reproduce pallets with weights as would have been featured in the Maison’s pocket watches during the latter half of the 19th century and now with the pallets ten times smaller than their illustrious predecessors. The escapement wheel, though almost invisible, has also benefited from special treatment. Normally, it is connected to its axis by four straight arms. On the Tourbillon Virtuoso IV, the escapement wheel has only two curved arms, which split its circumference into yin and yang symbols. The Amadeo® Fleurier Tourbillon Virtuoso IV is characterized by a pair of three-dimensional sculptures that have been produced and engraved entirely by the hands of the Maison’s artisans. Placed so that they mirror each other on either side of the jumping hour dial, these sculptures appear to support the dial. Four different themes are available, giving collectors the choice between elephants, horses, angels or doves—four interpretations steeped in strong symbolism often depicted in enamel on the pocket watches produced by BOVET in the 19th century. 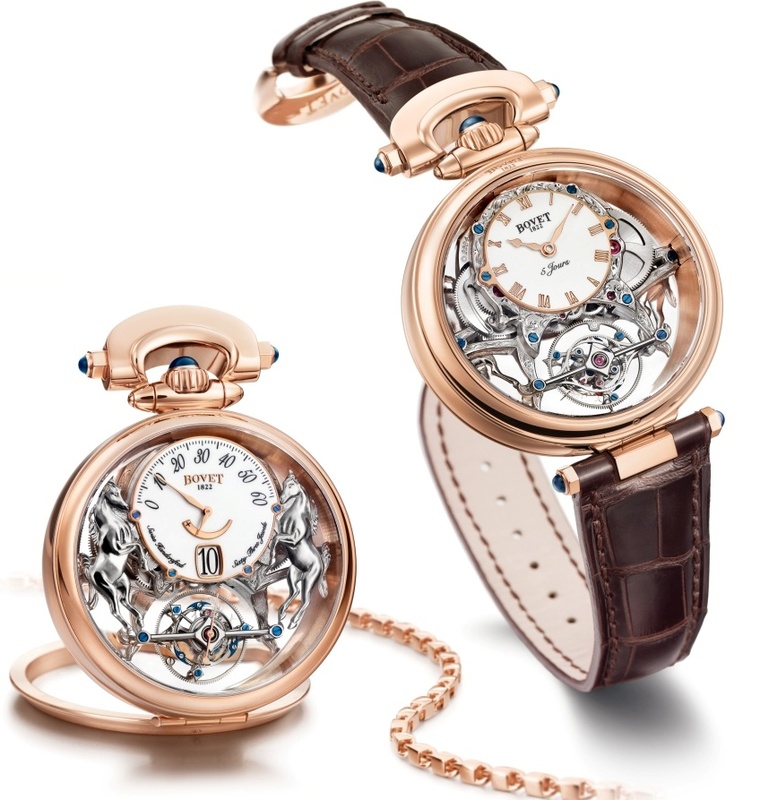 In this respect, their dual, mirrored representation also recalls the enamel decoration of the pairs of watches traditionally manufactured by BOVET for China in the 19th century.